World Weather Forecast, A Vision - Joel 2,3 The Day of the Clouds! The "Day of the Clouds"
(1996) vision is now in effect! 4 Lord stops the earth's rotation. 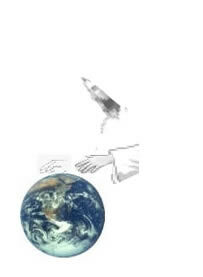 Then suddenly He placed both hands on the sides of the earth,stopping it instantly. What has happened since the vision was given? On 8-26-97, the Lord showed me that I was to make a separate picture of each cloud scene, depicting three different times, and three distinct levels of disturbed weather. We here at Take His Heart are not basing our insight solely on the fact of the "speed up" but on information revealed in our "corporate Flow Chart" through the Holy Spirit. (The Flow Chart has never been wrong when God illuminates something that is in it.) For more insight into this information read It Must be Written. - Link also provided at bottom of page. We see from the vision that we can expect more extreme weather and more clouds as time presses towards the second "speed up." Scene 2 (More clouds than depicted.) I will fill this in when the Lord reveals that we have entered this stage. I'm sure we will know somehow by His Spirit. For the stars of heaven and the constellations thereof shall not give their light: the sun shall be darkened in his going forth, and the moon shall not cause her light to shine. And I will punish the world for their evil, and the wicked for their iniquity; and I will cause the arrogancy of the proud to cease, and will lay low the haughtiness of the terrible. Put ye in the sickle, for the harvest is ripe: come, get you down;for the press is full, the vats overflow; for their wickedness is great. Multitudes, multitudes in the valley of decision: for the day of the Lord is near in the valley of decision. The sun and the moon shall be darkened, and the stars shall withdraw their shining. Who is going to bring forth the truth for people to be able to get into that valley of decision? These people have to hear something that brings them to a decision. The day of the Lord in the above scripture is the same day of the Lord in Ezekiel 30. Ezekiel 30:1-9 The word of the Lord came again unto me, saying, Son of man, prophesy and say, Thus saith the Lord God; Howl ye, Woe worth the day! For the day is near, even the day of the Lord is near, a cloudy day; it shall be the time of the heathen (NKJV - the time of the Gentiles; IB - it shall be the time of the nations). Blow ye the trumpet in Zion, and sound an alarm in my holy mountain: let all the inhabitants of the land tremble: for the day of the Lord cometh, for it is nigh at hand; 2 A day of darkness and of gloominess, a day of clouds and of thick darkness, as the morning spread upon the mountains: a great people and a strong; there hath not been ever the like, neither shall be any more after it, (God's strongest group of people ever on the earth.) even to the years of many generations. 3 A fire devoureth before them;.... 7 ...and they shall not break their ranks: 8 ...and when they fall upon the sword, they shall not be wounded (a protected people).... 10 The earth shall quake before them; the heavens shall tremble: the sun and the moon shall be dark, and the stars shall withdraw their shining: 11 And the Lord shall utter his voice before his army: for his camp is very great: for he is strong that executeth his word: for the day of the Lord is great and very terrible; and who can abide it? Scene 4, the Final Scene. What about the end of the vision, the earth's rotation being stopped by the Lord? Some thoughts: Speeding up the earth could also cause the weather to be disrupted, producing extremes in the weather which cause stronger winds and updrafts. 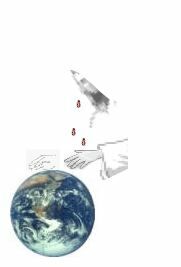 Stopping the earth, as symbolically seen in the vision, could mean no updrafts and no winds, which is also scriptural. Is this when the following scripture comes to pass? More thoughts: The Lord has revealed that the weather is going to have more extremes as we move through time because of the clouds being more violent. As time passes, all of this will become more apparent. God would not have His people ignorant. He does nothing without a purpose and scripture says He will warn people through His prophets! Before we get into His purpose, let's explore the effects of stronger winds and updrafts. It is only logical that the tumbling clouds in the vision would contain stronger winds and huge updrafts (extremes). Are strong winds, updrafts, and their effects consistent with scripture? One thing that happens when the wind becomes more violent in a thunderstorm is that it produces larger and more hail, because of stronger updrafts. If you read a dictionary definition of hail, you will find that hail is produced during thunderstorms, caused by water being held aloft by strong updrafts. It is logical that the stronger the updraft the larger the hail, because small hail, once formed, is held up longer and therefore becomes larger. Revelation 16:21 KJV : And there fell upon men a great hail out of heaven, every stone about the weight of a talent: and men blasphemed God because of the plague of the hail; for the plague thereof was exceeding great. Haggai 2:17 KJV : I smote you with blasting and with mildew and with hail in all the labours of your hands; yet ye turned not to me, saith the Lord. Revelation 11:19 KJV: And the temple of God was opened in heaven, and there was seen in his temple the ark of his testament: and there were lightnings, and voices, and thunderings, and an earthquake, and great hail. Scriptural reason for tribulations or judgments. Righteousness is a "learned" ACT! Little children, let no man deceive you; he that doeth (practices) righteousness is righteous even as he is righteous. surrounding the Day of the Clouds and The Lords Ships. Rapture Doctrines of Men The Lord's Ships. Pastor in the Ministry 15 Years Becomes Saved!